When manufacturing environmental equipment like pumps, samplers, and other measuring equipment, manufacturers frequently outsource the machining of their products’ individual parts. Machining equipment is typically complex and expensive, so most manufacturers contract with outside vendors to machine their parts, and then assemble parts into finished products in-house. While the cost barrier of in-house machining for environmental equipment manufacturers may be high, it can result in huge benefits. 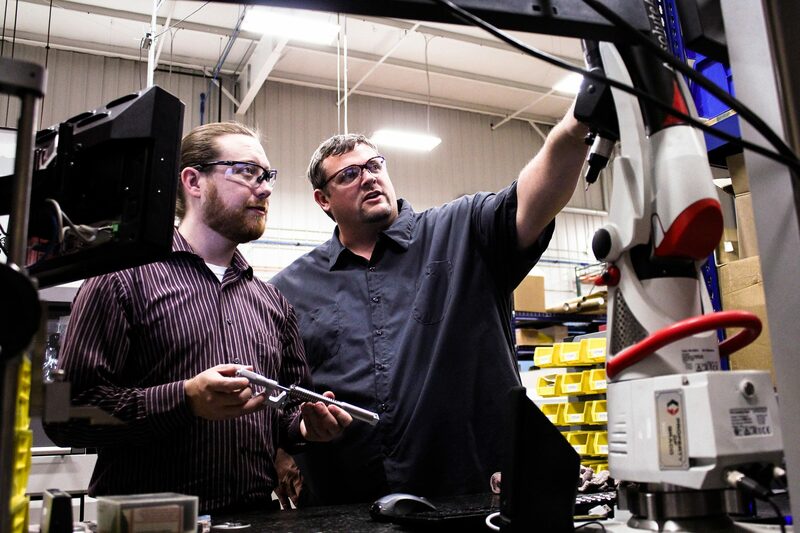 After making the investment in advanced machining equipment to bring machining in-house, QED has improved quality and reduced lead time while also achieving cost savings. When manufacturing complex parts, one of the most important factors influencing the quality of the finished product is the quality of a machine’s integral parts. Small imperfections or mistakes that occur during the machining of an individual part may in the future result in a number of problems related to the performance of a product as a whole. These problems range from a simple lack of durability to a complete failure or breakage of a device during operation. It would seem obvious that manufacturers would take all measures to prevent imperfections or defects in their parts, but there are often costs or other barriers that prevent most manufacturers from having complete control of every aspect of their own manufacturing process. When machining of individual parts is outsourced, this lack of control can become a major issue. Outsourced machining process takes a long time and may lead to quality issues. If a manufacturer uses an outside vendor to machine a part, the first step is to place an order. If it is the first time a particular vendor is being used, the vendor usually supplies a completed sample of the ordered parts to be inspected by the manufacturer’s quality department to verify that the vendor can meet the manufacturer’s standards. Upon verification, the manufacturer will place the order and the vendor will then acquire the necessary raw material to produce the requested parts. Once the vendor completes and inspects the ordered parts, they ship the parts to the manufacturer who inspects the received parts for quality. If the outside vendor’s work meets the manufacturer’s requirements, the manufacturer uses the parts to assemble their products. For many manufacturers, this is the optimal way to obtain machined parts while considering the cost of machining equipment compared to the cost of contracting an outside vendor. However, there are many places in the typical outsourced parts machining process in which issues can arise and mistakes may occur. For example, parts specifications may get corrupted, misinterpreted, or changed in the process of being sent and confirmed from the manufacturer to the machining vendor; the quality of raw materials used by the machining vendor may not be as good as it should be; and most importantly, the entire outsourcing process can take a long time. Additionally, as a cost reduction by the vendor, they may use generic material or cheaper material than what is called out by the specifications. Consider that the manufacturer must first send specifications to the machining vendor, who then must confirm those specifications (and possibly take the time to machine samples) and ensure they have the necessary raw materials on hand before any parts are officially machined for the manufacturer. When the parts are finished, the vendor must inspect them for quality, and then send them to the manufacturer, who must inspect the parts for quality again. Then, and only then, can the manufacturer begin to assemble the parts into the equipment they can sell to customers. Machining parts in-house provides manufacturers control over every aspect of the life of a part, from design all the way through assembly. If a manufacturer can overcome the initial cost of acquiring machining equipment, in-house machining can alleviate potential quality and lead time problems. For example, with in-house machining, the manufacturer will likely do its own initial prove out to determine the part’s exact cycle time and cost. Once the prove out is completed, the part is identified internally as a part to be made rather than purchased. When current stock quantities drop below a pre-determined amount, the machining department is prompted with an internal order. Raw material is automatically ordered and the machining department is issued a work order and puts the part in a queue to be produced. During the production run, the machinists will inspect the parts and will get approval from the quality department. Once the order is complete, parts are cleaned and moved into assembly. Manufacturers machining parts in-house can ensure that they use only the highest quality of raw materials. They are the masters of their own specifications, so the information is unlikely to be misinterpreted or changed by accident. Perhaps, most importantly, in-house parts machining produces higher-quality parts much faster than outsourced part machining. A manufacturer’s machinists work hand in hand with its quality department to verify that every part made meets and exceeds specifications. Parts no longer need to be checked for quality twice – the manufacturer can monitor them before, during, and after they are machined, enabling the manufacturer to identify and correct any quality issues that arise immediately, without any lost time in production or final assembly. An investment in advanced machining equipment also enables manufacturers to machine high-quality parts repeatedly after thousands of cycles. Since all manufacturing is performed within the same facility, the possibility of damage during shipment from a vendor, as well as freight costs are also eliminated. Overall, the process for in-house machining is much more streamlined than the process of machining using an outside source. QED is an example of a company that has recently made the switch to in-house machining of many of the parts used in its products. The change required purchase of several pieces of advanced machining equipment, including a Citizen Cincom L32 Swiss lathe, a Behringer Automatic band saw, and a Mazak Multiplex 6300YR. 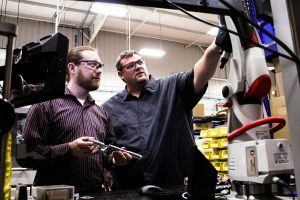 When outsourcing, some complex parts may require an outside machining vendor to manufacture parts on multiple different machines, introducing the ability for human error with each setup from one machine to another. 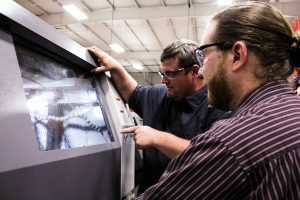 By contrast, the new machines are production centers that utilize both milling and turning features simultaneously to produce parts in a single setup. They produce parts completely on one machine without the operator having to touch the part. They also have a bar feeder and robotic arms, so even loading and unloading of parts at completion is done robotically. This level of automation greatly reduces the amount of human error that can occur with other types of machines and helps eliminate any fluctuation in cycle times for each part. QED is now machining many of its parts in-house and has been reaping all the benefits mentioned. One of the key success stories is the case of the drive shaft for the control valve on the QED ORP215M wellhead. The complexity of this part had created a unique scenario for QED, in which its machining vendors could not produce parts up to quality standards, or the vendor’s price per part was not within an acceptable range. The in-house machining department was in its infancy at the time, but with the product launch near and no outside vendor verified to produce the drive shaft, the machining department had to make the part themselves. With very little lead time, the machining department was able to deliver the parts to meet the product launch and fill all customer orders with no delays in delivery. They produced the parts at a cost per piece price that was 30 percent less than the lowest bid from the machining vendors. The example demonstrates both the advanced capabilities of QED’s machining equipment and the lead time and cost savings benefits seen by bringing in-house machining to QED. Machining parts in-house enables manufacturers to create the highest quality products more quickly and consistently than outsourced machining, and, in the long run, for a lower cost.